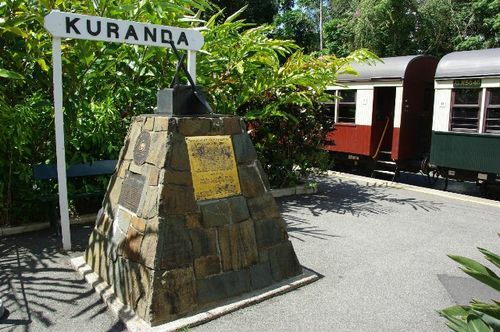 Plaqued pyramidal cairn commemorates the centenary of the completion of the railway from Cairns (Redlynch) to Kuranda. A second plaque unveiled in 2005 recognises the construction of the railway as a National Engineering Landmark. The construction was a technical feat of its time due to its benching in old slide planes of decomposed rock, much of it at the natural angle of repose reaching to the bed of the river hundreds of metres below. The line provided the most important catalyst for the development of Cairns and the permanent settlement of the Atherton and Evelyn Tablelands. Cairns Kuranda railway is of unique historic, technical, aesthetic and cultural significance to the nation. Built at the end of the 19th century it illustrates the use of railways as a development tool for the nation. It played its part in making Australia, for a time, the world's leading producer of gold and tin. The contractor, John Robb, was a man with a national reputation. His subsequent bankruptcy illustrates the catastrophic results of the depression of the nineties. As an engineering feat, it is the only example in Australia of a narrow gauge railway constructed in an otherwise inaccessible gorge through rainforest and under tropical weather conditions. It was constructed at a time when the region was deemed too harsh an environment for Europeans to work in. This Plaque Is To Commemorate The Centenary Of The Construction Of The Rail Line From Redlynch To Kuranda Which Was Opened To Goods Traffic On The 15th June, 1891. Work On The Line Commenced In May 1886. The Construction Of The Line Was Divided Into Three Separate Contracts And Using Fortitude Dynamite, Buckets And Hands, The Project Was Completed In 5 Years. At The Height Of Construction 1500 Workmen Were Employed On The Project. Queensland Government Railways Chief Engineers, Willoughby Hannam and Thomas Annett designed and supervised this railway; John Robb, the contractor, and his European migrant workforce built the line, bridges and tunnels between 1886 and 1891. The railway climbs 323m in 21.7km through the rainforest of the World Heritage Wet Tropics, across the very steep, loose sides of Barron Gorge and over some extraordinary curved iron truss bridges. It was built to develop the large mineral and agricultural area of Far North Queensland. During World War 2 it also serviced huge military camps and hospitals.